Type, or write on the blackboard, sets of three words. The students have to choose which one is the odd one out. It doesn’t matter what the correct answer is – as long as students can justify their opinion. The aim is to get them thinking about the meaning of words. Make three columns, students put the words in what they think is the most suitable column. Sometimes there may be a debate about if the word is either positive or negative, but that can be a good thing – as students are discussing the word, they are practising it. This activity is very good for revising vocabulary. The teacher chooses which words he/she wants to revise, or these could simply be words taken from the wordlist at the back of the students' book. The teacher gives different groups of words to the students, who are going to work in pairs. Each pair writes 3 definitions for each word – one correct definition and two incorrect ones. When this is done, each pair joins another pair. The pairs take it in turns to read their definitions to each other, and the other pair tries to guess the correct meaning of each word. This is very easy to organise. The teacher writes 4 sentences about herself on the board. Some of the sentences are true and some are false. 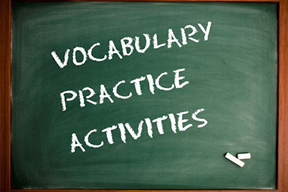 Each of the sentences contains some of the vocabulary that you want to practise. The students have to guess which ones are true and which ones are false. One way that they students can check their answers is to ask questions to the teacher to find out. This makes the activity communicative and more interactive. This activity can be followed-up by students writing their own true / false sentences. This is a competitive and dynamic activity for learners of different ages and levels. Students are divided into two or three groups. Ask one student from each group to sit in a chair with their backs to the board, facing their group. Write a word on the board so that the students in the chairs can't see the word. Other students must give clues and explanations without using the word so that their volunteer guesses the word. The first student to guess the word gets a point for their team.